Like many, Crystal and I are coffee lovers. When we heard that a new shop opened on the east end of Kansas City, Kansas we were eager to try it out. 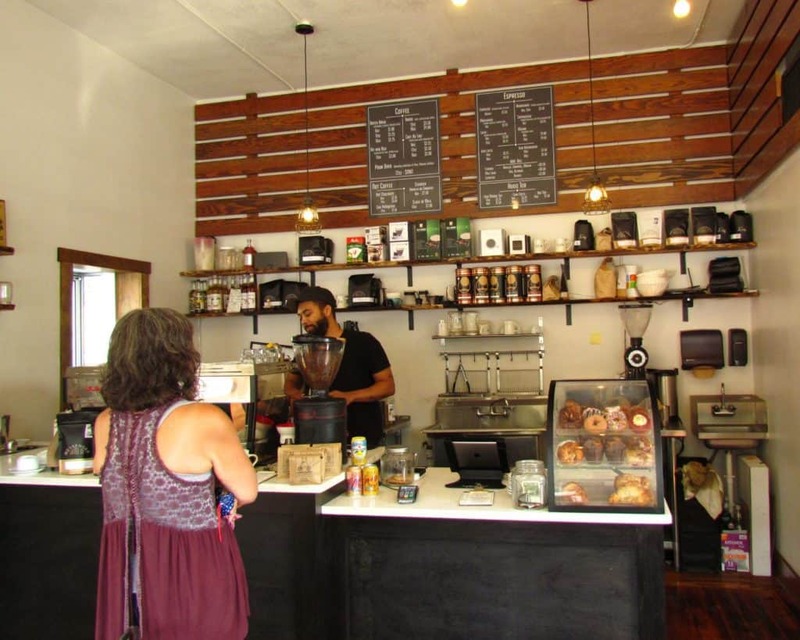 We stopped by Splitlog Coffee, at 548 Central Avenue, to check out their digs. Our timing was perfect, as we had the pleasure of a bright, sunny Saturday morning. For years this area of KCK had just existed. Nearby is the I-70 exchange, which whisked people East toward KCMO or West toward the speedway. Except for the locals, people for the most part avoided the area. Quietly the neighborhood has been slowly transforming. The Strawberry Hill area has a long, and storied history in KCK. Most people in the area know the Slavic connection, but fewer recognize the significance of the name Splitlog. We covered it in a little detail during our article on the Strawberry Hill Museum. (You can read more here>) Sitting near the southern edge of Strawberry Hill, Splitlog Coffee joins some other recent additions to the area. Many of you are familiar with SLAPS BBQ, which has made quite a name for themselves in the KC restaurant scene. Another recent newcomer is Mockingbird Lounge, which has become a hot spot in the happy hour category, and the place to catch a great downtown view. 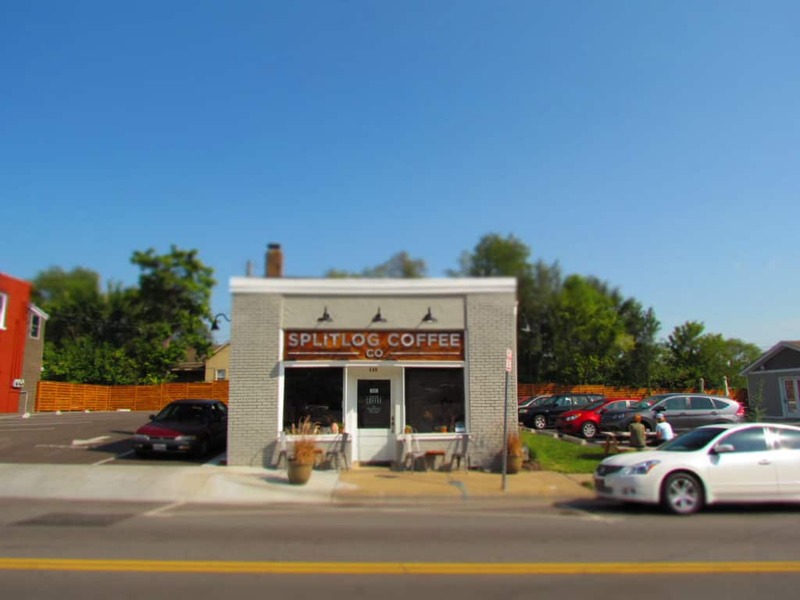 Splitlog Coffee is housed in a smallish shop, but has ample room for what it serves. A good selection of tables are available for patrons, as well as window view seating across the front of the store. A picnic table outside offers some fresh air seating during nice weather, and a drive-thru option is available for those on the run. We wanted the full flavor of the place, so an indoor visit was in order. Our stop was on a Saturday morning, and the place was already half full upon our arrival. Couples lingered over coffee, while nearby some others worked on laptops. It had all of the markings of a true 21st Century coffee shop. The barista on duty explained the menu, as well as a little of the back ground of the business. The building used to house Flywheel Coffee, so the owners are familiar with the coffee business. They enlisted Simeon Bricker, an award winning barista who has local history with The Roasterie, to manage the daily operations of the business. Splitlog Coffee doesn’t roast their own beans, and instead focus on the end processes of coffee making. The majority of their beans are a Kenyan or Ethiopian variety, which they have roasted by Messenger Coffee, which is a Kansas City craft roaster. These full flavored roasts are delicious, and a great start to the day. We opted for an artistic set of drinks, so that we could let the barista show off their flair. 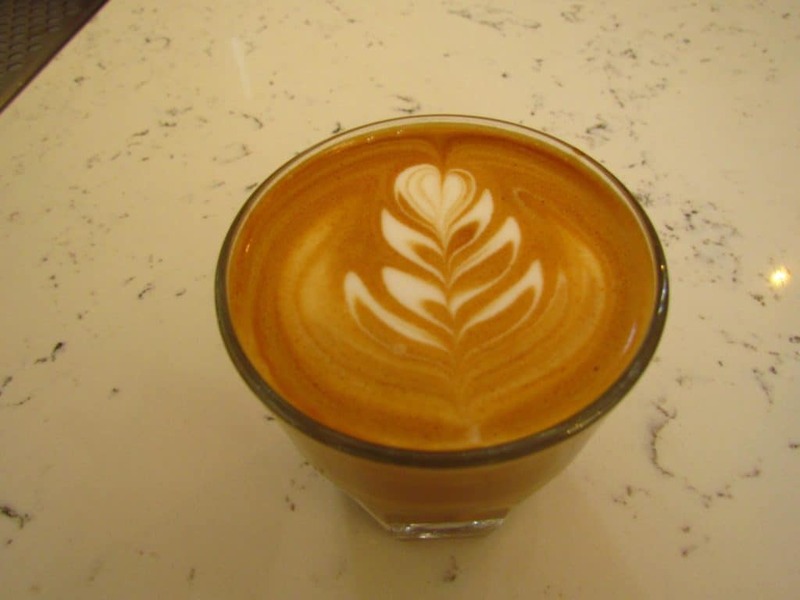 The prices for these lattes were very much in line with what we find at other specialty coffee houses. 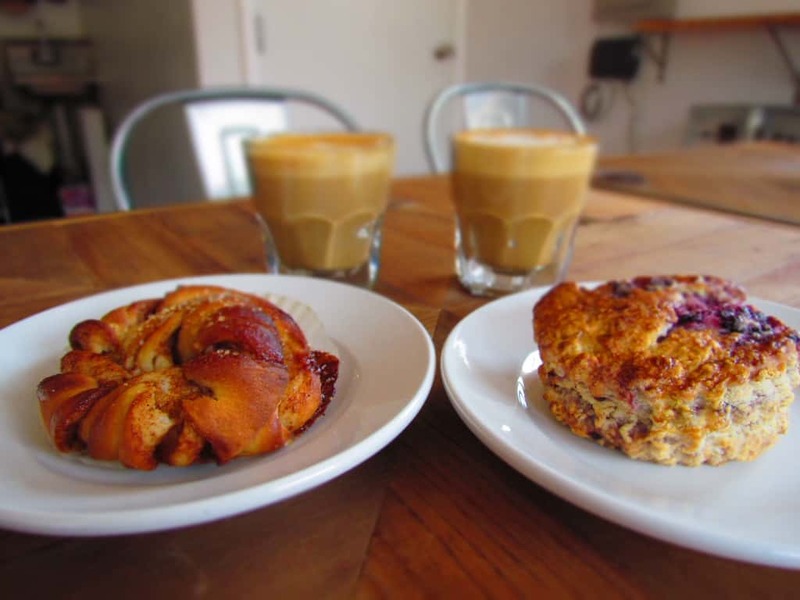 Splitlog Coffee offers up a handful of food options to accompany their drinks. These are made off site, so that staff can focus on the coffee. The morning we visited the options included donuts from Hana’s Donuts, which is a local favorite from our neck of the woods. They also had a variety of scones, muffins, and assorted pastries from Sunflower Bakery. Since we were not familiar with this place, we decided to opt for their goodies. We picked out a Cinnamon Apple Turnover, and a Blueberry Scone to share. Both of these were delicious choices, and went well with our flavored drinks. We struck up a conversation with a couple at a nearby table, who were first timers to this location, as well. They were just as enamored with the quality, as we were, which helped confirm for us. We savored our choices, before thanking the staff for the wonderful start to our day. Now that we were caffeinated, and our bellies filled, we were ready to begin the next phase of exploring. 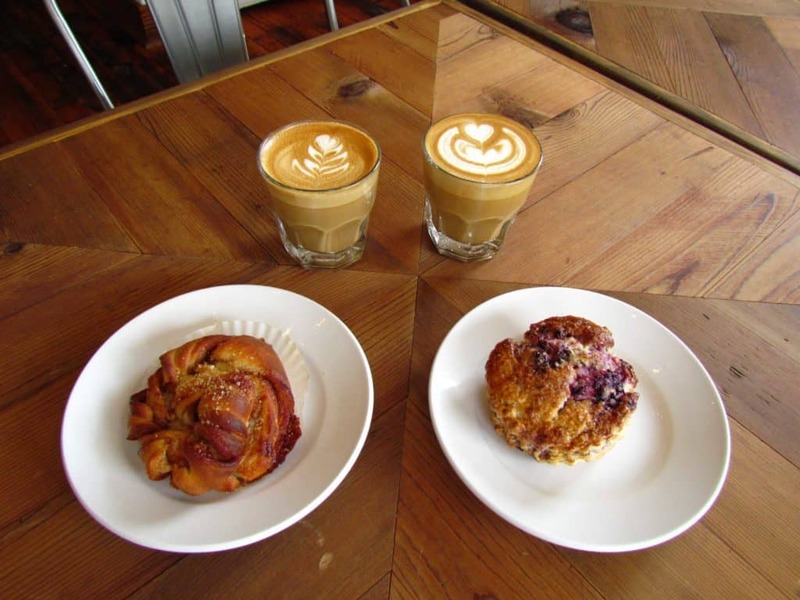 We are certainly looking forward to finding reasons to swing by Splitlog Coffee again, and sample some more of their intriguing offerings. Have you visited this new KCK landmark? Let us know your thoughts on them. We want to thank Visit Kansas City, Kansas for sponsoring our visit. As always, the opinions are our own.